By far, this has got to be my favourite dessert among all the rest of the recipes which I have adapted and modified. I would say that it is also the most successful and tasty one as well. Yeah! I was (still am) so happy when the cheesecake came out PERFECT after hours of setting on the tabletop & fridge. Heavenly! 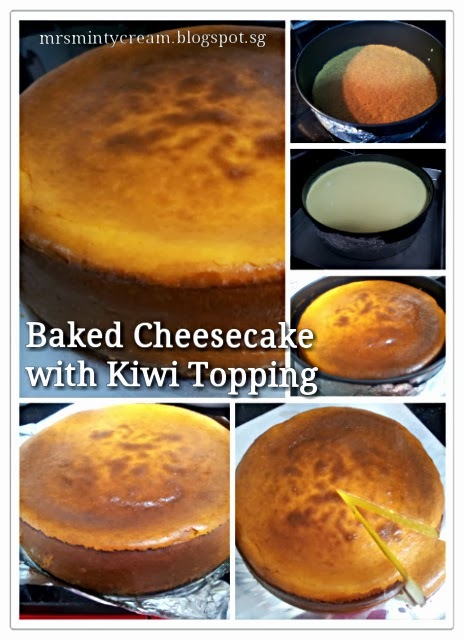 The texture and taste of this baked cheesecake is very similar to those New Yoke Cheesecakes which are available around coffee places and cafes. I like the creamy, cheesy, lemony taste of the filling as well as the buttery and slightly salty biscuit base at the bottom. In just one day, 3 quarter of the cake is gone! 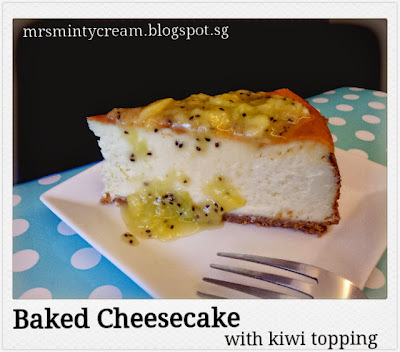 Hubby prefer the plain cheesecake while I liked mine with the kiwi toppings. Fresh and slightly acidic, the kiwi gave a perfect punch to the flavour of the cheesecake. You can even bite into the small bits of kiwi pieces in the topping. Love it love it love it! 2. Grease baking pan (Medium spring form cake pan, diameter 22cm) by spraying a layer of non-stick spray on it before lining the base with aluminium foil on the outside. Set aside for later use. 3. To prepare the digestive biscuits crumbs, you may either break up the biscuits into crumbs using a food processor or place them in a zip lock bag and break them up to crumbs by rolling a rolling pin over the biscuits in the bag. 4. Add melted butter to the crumbs and mix well. Pour the biscuit mixture into cake pan and pressed it firmly and evenly in the pan. You may make use of the base of a ramekin to help you. Bake for 8 minutes in the centre of the oven and set aside while making the cheese filling. 5. Cream the cream cheese with sugar to ensure a good mix. Add eggs, sour cream, flour, salt and vanilla extract into the mixture and mix until smooth. 6. Add lemon zest and lemon juice to the mixture and mix well. Once there are no lumps in the mixture, you may stop mixing. Do not over mix so as to prevent cracks on the cheesecake. 7. Pour filling over the biscuit base. Shake the cake pan slightly to ensure that the filling is evenly spread and any air pockets within the mixture are removed. 8. Bake in the oven for 1 hour 10 minutes. 9. When out of the oven, cool completely on table top (I cooled it for 4 to 5 hours) before transferring the cheesecake to the fridge to chill overnight. 10. Blend the kiwi to a pureed. Place the pureed kiwi in a saucepan and sugar to it. Heat the mixture under low flame until the sugar is dissolved. 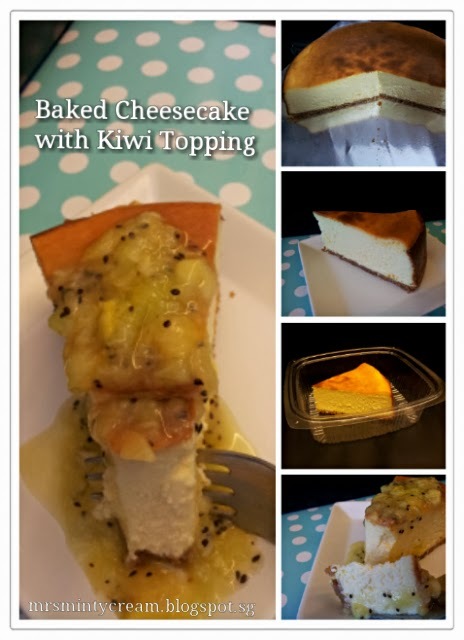 Drizzle the kiwi topping on the cheesecake before serving. Baking the cheesecake for 1 hour 10 minutes, the top of my cake is a little too brown. You may adjust the timing to bake for an hour. It should give a better colour.